My hundredth post! Can I get a bow wow? 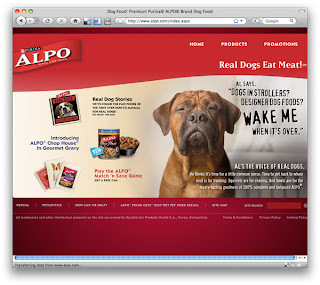 Dogs trust Alpo. I think it's right up there with dead squirrels. 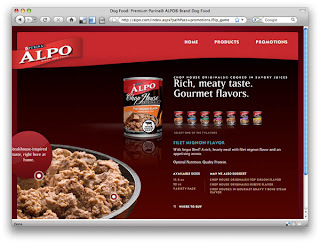 Hot-spots on dog food! Is there no end to the universal usefullness of the hot-spot? It's as if..the hot-spot is the duct tape of the web! 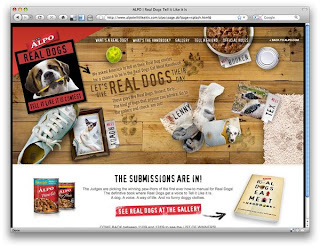 Anyway, Alpo's writing a book called Real Dogs Eat Meat, and they took stories from people about their dogs. Sounds familiar (see last post below). I do think this is perhaps a better execution, as they end up with a tangible product that they can resell back to us. Smart puppy. A game! I wish I had a "game alert siren". This one is your very basic "memory match" game. 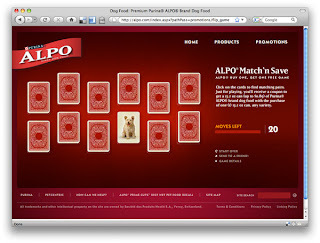 However, they have a great payoff - you can download and print out a coupon. Granted the coupon isn't that great, but it's the thought that counts. I think they should beef up the reward and make it a coupon book or something. They're on to something here. I have yet to see a game that offers a reward..most are self-indulgent "hope they waste time on my site" wastes of time. I'm a gamer and quite addicted to Xbox Live achievement points -- which are used for nothing. I hope we see more of this kind of thinking.